Mary Jane is a Wolf Hybrid whom I have been fortunate to live with and learn from. She was just seventeen weeks old when she came into my life. 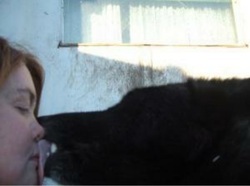 She had not been properly cared for and was the most frightened animal I had ever encountered. Mary Jane's mother was a Timberwolf, and her father a Timberwolf Malmute cross. I read many books, and visited multiple web sites to ensure I would give her the best care I possibly could. While young I worked hard to socialize her because wolves are such shy animals. I took her on daily walks let her play with other animals in the neighborhood, but she would not let any humans touch her except my sons and myself. In the beginning the other animals in my home got along with and played with her, but somewhere around seven months old Mary Jane's prey instinct kicked in and the other animals were no longer her friends. At a year old Mary Jane was consuming all of my time and energy! She no longer had the other animals to play with. I was determined to find a way to help her, and myself, I was bruised from head to toe from her playing with me. I spoke with other wolf dog owners and found out she need a mate. I then rescued another hybrid. His name is Punk and he is a Timberwolf Huskey mix. He was not nearly as high content of a wolf dog as Mary Jane which made the handling of him a much easier task. Family and family structure are an important part of a wolf's life. 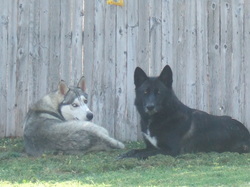 Before you know it their was a pack of wolf dogs in my life. Playing with and watching the way they work and play with each other was a great joy. Mary Jane had three litters of pups, a total of 25 puppies. I kept two females from her first litter so that her and Punk could enjoy being parents. Mary Jane's pups would come out of the den at three weeks old. Once they would venture out she would allow me to interact with them. Her trust in me was amazing. I could leave the enclosure with her children and keep a couple of them in the house with me for a few days at a time. I would bottle feed them and take them around other people so were able to trust humans and not be as shy around them the way she was. One of her pups at the age of two had pups of her own. Her name is Oni Chee Chi Sss Kwa (snow bird). Wolves and wolf dogs are wonderful parents. They are constantly caring for and teaching their young. The young are also very obedient to their parents. When moving to Arizona the decision was made that it would not be a good place for Mary Jane to live. She need four real seasons and room to roam. She and her daughter now live in a Wolf Sanctuary in North Carolina. When I have earned my degree it is the kind of place I am hoping to work and spend the rest of my life with the animals I love so dearly!